In a successful attempt to get students involved in the US Presidential Elections, Mr. Ivica Bocevski, together with NOVA’s MEP Office organized a simulation of the third US Presidential debate between Governor Mitt Romney of Massachusetts and President Barrack Obama. The event was attended by many students, the Novakovski Family and the US Ambassador in Macedonia, H.E. Paul D. Wohlers. 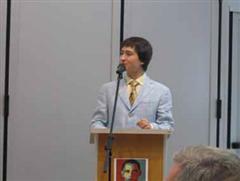 The event consisted of Mr. Ivica Bocevski and Lav Georgievski in the role of President Obama, and Mr. Aleksandar Mitreski and Monika Spancheska as Governor Romney. The debate was kicked-off by the moderator, David Dlaka, who explained the schedule, rules, and roles of everyone participating. The debate began with a panel on the war on terror, with Governor Romney’s (Monika Spancheska) opening speech, followed immediately by President Obama’s (Lav Georgievski) speech. Afterwards, Mr. Bocevski and Mr. Mitreski debated on foreign policy. The debate got heated and candidates argued aggressively, thereby successfully simulating the town-hall format of the actual US Presidential Debate.